Jack passed away on October 11, 2018 at the age of 54 after a brave battle with cancer. Jack is the cherished son of John and June Van De Bemt. Much loved brother of Kathy Larimore, and Bill and Chuck Van De Bemt. Dear brother-in-law of Steve Larimore and Mary-Joe Van De Bemt. Adoring uncle of Nicole (Greg), Ryan (Kayla) and Ashley (Caleb) Larimore, Bryan and Megan (Ricardo) Van De Bemt and Samantha (Alex) and Adam Van De Bemt. Devoted great uncle of Madison and Evelyn. 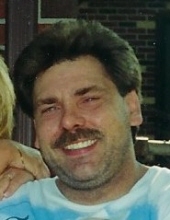 Jack loved his family and friends, working on cars, going to the races, country music, and karaoke. Memorial gathering will be Sunday, October 14, 2018 from 4pm to 7pm with a memorial service to follow at 7:00pm at R.G. & G.R. Harris Funeral Home 31551 Ford Rd., Garden City. There will be a celebration of life following the service at Village Bar & Grill 35234 W. Michigan Ave., Wayne MI at 8:30pm. To send flowers or a remembrance gift to the family of Jack Van De Bemt, please visit our Tribute Store. "Email Address" would like to share the life celebration of Jack Van De Bemt. Click on the "link" to go to share a favorite memory or leave a condolence message for the family.